Vivo smartphones have been evolved a lot over the years. The company launched quite a few innovative smartphones last year. Vivo got the pricing right too with most of its smartphones, if not for all. Today, Vivo India has introduced the all-new ‘Vivo Xchange’ program – a new trade-in offer for its fans, to exchange their old phones and upgrade to a new Vivo smartphone on Vivo’s in-house e-store website shop.vivo.com/in. Vivo Xchange Program is a new trade-in offer for its fans, to exchange their old phones and upgrade to a new Vivo smartphone. The upgrade program is designed for both existing Vivo customers as well as for other smartphone users looking to buy a new Vivo smartphone. The company has partnered with leading online e-commerce brand Cashify.in, to ensure seamless trade-in process. As an introductory offer, Vivo is offering an additional INR 1000 bump-up exchange of their old Vivo smartphones from 16th – 19th January 2019. “Being a customer-centric brand, Vivo has always aimed to offer great value to its fans. Under this partnership, customers can now seamlessly exchange their old phones and upgrade to a brand new Vivo smartphone of their choice. 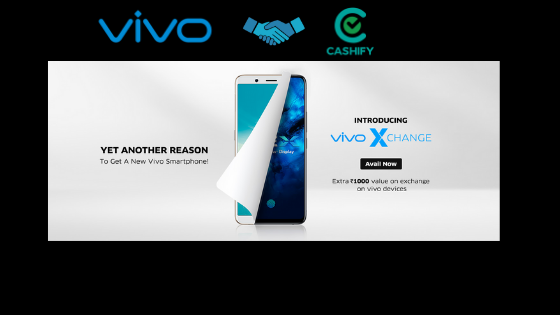 We are pleased to partner with Cashify.in as the exclusive buy back partner for Vivo, in India”. Vivo, an innovative global smartphone brand, entered India in late 2014. With a strong focus on “Camera and Music”, Vivo has established itself as one of the top smartphone brands in India. Manufacturing in Greater Noida, the company has a robust distribution network across the country both online and offline, catering the best in class quality services to over 539 cities, in 27 states and 5 union territories backed by more than 550 service centers in India. The organization is dedicated to the pursuit of perfection and is continuously creating surprises for users through constant innovation. Through smartphones, Vivo offers users a professional-grade photography solution, taking mobile photography to the level of an art form, witnessing and recording all of life’s beautiful moments. Cashify.in is India’s pioneer for Exchange & Buy-Back for all used smartphones and electronics as well as is the market leader in the e-commerce ecosystem in India. For their million+ customer base, selling anything on Cashify.in means Easy & Instant payment. Cashify is expanding business rapidly across India, and are currently present in 23 cities to offer the services.